The author of the essay from which this article has been adapted has been undertaking research into Captain Sir Samuel Brown at the National Archives of Scotland. Brown's correspondance and other papers have survived, passed down from the law firm he used for a number of years, through the Home family and successive practices. Brown used the law practice of John Home (1758-1831), who was admitted as a Writer to the Signet (WS) in 1812. In Scotland, a WS is a senior solicitor who conducts cases in the Court of Session. Home was the eldest son of George Home, town Clerk of Leith, Edinburgh. He practiced at 12 Charlotte Street, Edinburgh, and this continued to be the office of successive firms. The Home family connection passed to John's son William Home (d.1846). When Home died, the building transferred to William and his then partner in the firm John Gibson, which traded as Gibson & Home in William's lifetime, and subsequently became the firm Strathern & Blair. William's son, John Home (d.1890), was admitted as a WS in 1866. The firm became Anderson Strathern LLP on 1st September 1992, the year J & F Anderson and Strathern & Blair merged. The papers in the National Library of Scotland are held as Papers of Sir Samuel Brown (Strathern & Blair MSS). Research is ongoing. 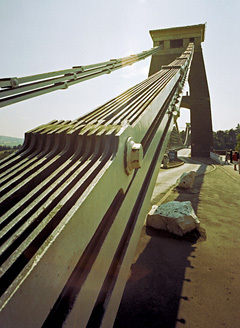 Isambard Kingdom Brunel's Clifton Suspension Bridge (begun 1836, completed 1864) in Bristol, UK. Two thirds of the chain links came from the Hungerford Suspension Bridge over the Thames in London, also by Brunel but dismantled in 1863. The bar iron was manufactured by the Dowlais Ironworks in Merthyr Tydfil, Wales. 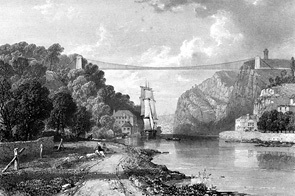 Captain Sir Samuel Brown's 1830 proposal for the Clifton Suspension Bridge competition.